Comments Off on Library Research Prize Winners! 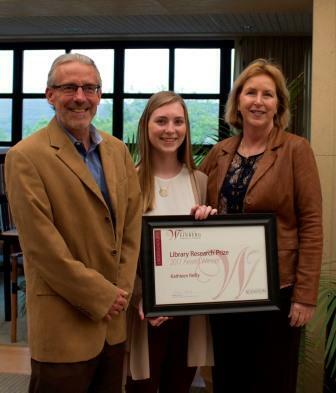 Kathleen Reilly is the winner of the 2017 Library Research Prize for undergraduate students. To complete her Honors Thesis, Girls at the “U”: A History of Coeducation at the University of Scranton, she spent “countless hours” gathering information from primary documents located in the Helen Gallagher McHugh Special Collections and University Archives and on the Library’s Digital Collections website. The Weinberg Memorial Library inaugurated the prize in 2011 to recognize excellence in research projects that show evidence of significant knowledge of the methods of research and the information gathering process, and use of library resources, tools, and services. Honorable Mention awards in the undergraduate category included Mariah Ruther, a senior Nursing major; Kerry Ann Randall, a junior Occupational Therapy major; and Michael Ramsthaler, a sophomore Exercise Science major. 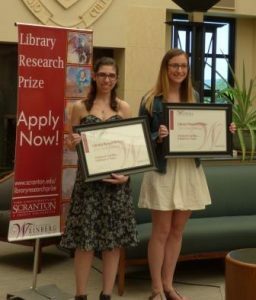 Christina Gavalas and Marjorie Toron are the winners of the 2017 Library Research Prize for graduate students. They completed a group project for OT 501: Leadership in Occupational Therapy. Their research gathering included items on microfilm, items in the basement, and items in databases far removed from occupational therapy. In their application essay, they said how invaluable library staff members were to them. An Honorable Mention in the graduate category was given to a group of Physical Therapy students–Katelyn Moyer, Daniel Dolphin, Robert Roncek, and Steven Roughton. 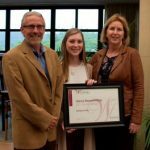 Prize winners were honored at a reception on Thursday, May 11, 2017 in the Heritage Room of the Weinberg Memorial Library. The Library’s computer lab will be open for student use during the hours that the Library is open beginning Monday, May 8 through Friday, May 19 for the 2017 Spring Semester. Please take note of the student use policy that is posted in the room. We are working on resolving this issue. In the meantime, please use the ILLiad system to place your request. The Library’s computer lab will be open for student use during the hours that the Library is open beginning Monday, November 28 through Friday, December 9 for the 2016 Fall Semester. Please take note of the student use policy that is posted in the room. Print jobs can be sent to any of the Pharos print stations. This award encourages library users — professors, administrators, students — to submit nominations about how their librarian makes a difference on campus or in the community. Up to 10 librarians in public, school and college, community college and university libraries will be selected to win $5,000 and will be honored at a ceremony and reception in New York, hosted by Carnegie Corporation of New York. In addition, a plaque will be given to each award-winner’s library. Nominations are open through September 19, 2016, for the I Love My Librarian Award. Nominate your favorite College, Community College, or University librarian today! 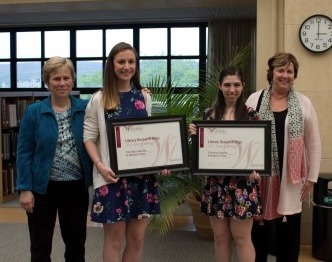 Christina Gavalas and Marjorie Toron, seniors in the Occupational Therapy program, are the winners of the 2016 Library Research Prize for Undergraduate students. They completed a group project for OT 494: Evidence-Based Research. Honorable Mention awards in the undergraduate category included Alyssa Rodemann, a senior Psychology major; Emily Pocius, a junior English major; and Tim Zinna, a sophomore Finance major. 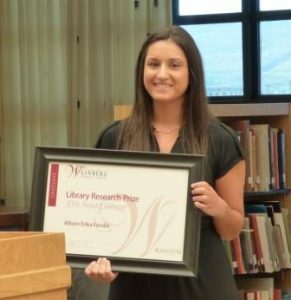 The winner of the 2016 Library Research Prize for Graduate students is Allison Ferullo. She is a student in the Nurse Anesthesia Graduate Program and is certified as a Critical Care Registered Nurse (CCRN) as well as in Trauma Nursing Critical Care. Her individual project for NURS 593: Research Methodology was a literature review on distractions in the operating room. 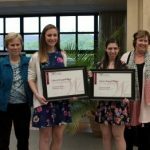 Prize winners were honored at a reception on Thursday, May 12, 2016 in the Heritage Room of the Weinberg Memorial Library. 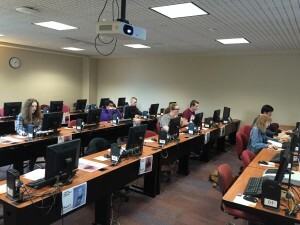 Beginning Sunday, May 1, 2016, the computer lab in the Weinberg Memorial Library – WML 306 – will be an open computer lab for student use during regular Library Hours. Open lab status last day will be Friday, May 20, 2016. Print jobs can be sent to either the print station on the second floor, the print station in the ProDeo Room, or either of the printers in the Reilly Room. The Framework document identifies a cluster of six interconnected core concepts or “frames” through which to understand, teach, and develop information literacy. These six frames are presented alphabetically and do not suggest a particular sequence in which they must be learned. ¹Ariew, Susan. 2014. “How We Got Here.” Communications in Information Literacy 8 (2): 208-224. On its simplest level. . .the ability to read and write. The other four literacies depend on basic literacy. There are 93 million adults in the U.S. who read at or below the basic level needed to contribute successfully to society. Additionally, PA Forward, an initiative of Pennsylvania libraries, indicates that 13 percent of Pennsylvanians lack basic literacy skills such as the abilty to read a newspaper or a brochure. In Lackawanna County, about 20 percent of adults are functionally illiterate. That means that while they are able to read and write, these skills are so basic that they struggle managing the requirements of their jobs or sometimes routine tasks of daily living. This statistic is provided by SCOLA Volunteers for Literacy, a division of the United Neighborhood Centers of Northeastern Pennsylvania. They offer more than 60 programs such as reading, comprehension, life skills, typing, math, vocabulary, spelling, grammar, as well as ESL (English as a Second Language). SCOLA offers tutoring opportunities for volunteers. Faculty at The University of Scranton have been collaborating with the Scranton School District to increase literacy in the region. They also want to raise awareness about illiteracy among local doctors and school nurese through the Reach Out and Read program. Individuals as well as small businesses and organizations contribute to the economic vitality of their community through innovation, entrepreneurship, and economic development. April has been declared Financial Literacy Month. the experts at Money Management International (a nonprofit, full-service credit counseling agency) created FinancialLiteracyMonth.com. Begin your 30 step path to financial wellness any day of any month to help you create a successful strategy to better your overall financial position. Money Smart Week®, a public awareness campaign designed to help consumers better manage their personal finances, is April 23-30 for 2016. It was created by the Federal Reserve Bank of Chicago in 2002. My.Money.gov – This website is organized around the MyMoney Five principles so you can quickly identify resources and tools to help you in these areas. The Tools page page can help you locate and use on-line calculators, budget worksheets, planning checklists and other helpful resources from the federal government for making financial decisions. Advantage Credit Counseling Service, Inc. (ACCS) is a non-profit credit counseling organization incorporated in 1968, Advantage Credit Counseling Services is committed to educating consumers about wise money management and the responsible use of credit. Try their free online budgeting and goal tracking tools. Bankrate, Inc., the Web’s leading aggregator of financial rate information, offers a 10 question Financial Literacy Quiz. You get instant feedback! Here at The University of Scranton the Small Business Development Center (SBDC) at works to grow the economy of Northeastern Pennsylvania by providing entrepreneurs with the education, information and tools necessary to build successful businesses. For more information, visit the SBDC site.